See Recipe Video Above. 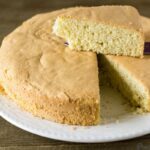 Vanilla Sponge Cake - light, airy, fluffy, eggy, not-too-sweet cake with ah-mazing vanilla flavor. This Vanilla Sponge Cake is made without any butter or oil. You only need a few simple ingredients and you have a great-tasting cake! Preheat oven to 350 degrees F (180 degrees C). Brush a 9-inch round baking pan with 1 teaspoon of oil. Put in about 2 teaspoons of flour an dust round the pan. Separate egg yolks from egg whites. Beat egg whites with an electric mixer until they form a soft peak. This takes about 2 minutes. Gradually add sugar and beat together with the egg whites until they form a stiff peak. This takes about 2 more minutes. Add the egg yolks to the beaten egg whites. Add vanilla extract then whisk in gently with a whisk until just combined. Sieve in flour, baking soda and salt, a little at a time and gently whisking them in each time you sieve them in. Mix in the dry ingredients until just combined. Use a spatula to scrape the sides of the bowl, being careful to mix in any flour you see. Pour the batter into prepared cake pan being sure to clean the batter off the bowl using the spatula. Bake in preheated oven for 30 minutes until a toothpick inserted in the middle of the cake comes out clean. 1. It is important not to overmix when adding the other ingredients. 2. You can beat the egg whites with a fork/whisk (that's how I beat them back in the day) but it is quite a workout! So if you have an electric mixer, use it.